Spike Mason is an agent with the U.S. Naval Intelligence. We watch his service in the days leading up to but not yet at the entry of America into World War II. The States is helping its allies but still has no found the motivation to break its official neutrality. The Germans are attacking ships everywhere it seems. Japan has expanded throughout the Pacific and rules with a very tight fist. The war lines are being drawn darker every day and America is in constant need of intelligence. The CIA does not yet exist. Its precursor, the OSS has not been formed yet either. The gathering of intel on the actions and movements of the soon-to-be enemies falls on the shoulders of the Armed Forces and since much of what Japan has accomplished rests with its navy, the U.S. Navy is extremely busy in the Far East. To that end, we have Mason, an officer (we presume) in the Navy on undercover assignment in the danger zone, taking as his role the job of First Mate aboard a good sized cargo vessel, the S.S. Malibu. It is not clear whether the ship goes wherever Mason feels the need to investigate or whether the movement of the ship just happens to bring Mason to numerous hotspots. Regardless, it seems wherever the Malibu takes Mason, there is something not pleasant happening. We learn so very little about Mason in the eight short adventures we follow him through. He is definitely good looking. He has wavy hair of apparent auburn color. A couple of panels showing him shirtless reveal that he is in fanstastic shape with considerable muscle which explain how he is able to perform many of the physical maneuvers he has to in order to stay alive. In the first adventure, he makes friends and get much needed assistance from the Malibu's quartermaster, a husky knucklebuster named Ford. We will see more of Ford's personality over the few adventures available to us and it shows an impetuous fellow who loves to race into trouble, usually but not always making it worse. He is decidedly loyal, though, and obviously once a friend always a friend with Ford. The Mason of 1940 would definitely not be considered politically correct today as he refers to more than one Oriental he encounters as "coolie" and even better, "slant-eyed scoundrel". Certainly a man of his era. He does love his country and from the looks of things, he loves adventure and danger and he finds both all over the Pacific. Feature Publications, also known as Crestwood Publications, was a publishing house that stuck around for over two decades. 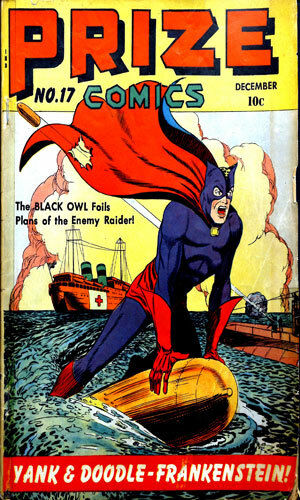 Getting its start in the pulps, it branched into comics and brought out its main character, the Black Owl in its primary magazine, Prize Comics. 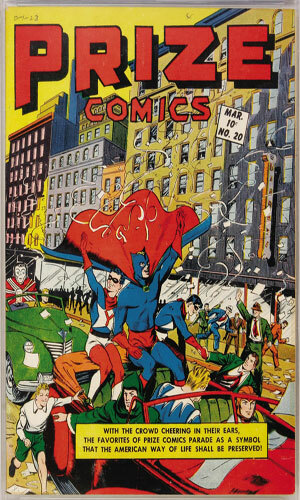 As time went by, it launched several different titles including several in the romance field when crime fighters grew passé. 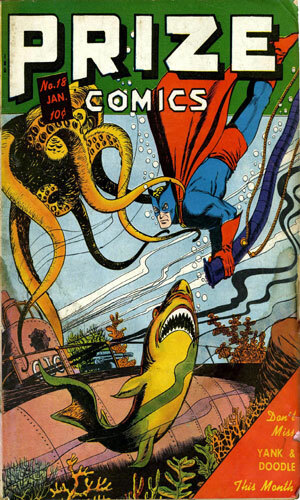 Issue #16 saw the introduction of Spike Mason in November of 1941. 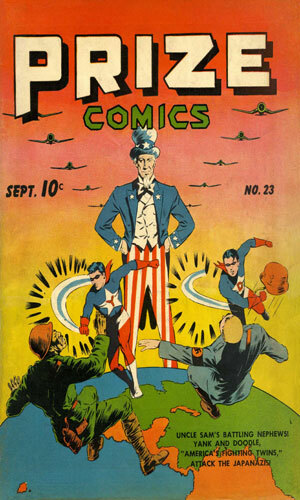 Keeping in mind the required lead time for such a magazine, the stories were likely created several months earlier, before the attack on Pearl Harbor and America's entry into World War II. 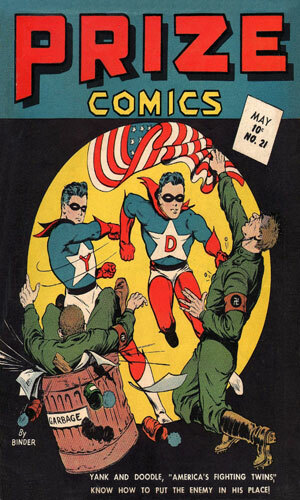 The first story saw Mason go up against Nazis, strange for taking place in the Far East. From then on the enemy was clearing Japan, which makes more sense for a vessel headquartered in the Pacific. The approach of having Spike Mason be an undercover agent using a non-military cargo vessel as his cover was an interesting one, at least to me. Since the character only survived eight adventures, maybe not too many others. From Prize Comics #16 - Undercover as the first mate of a cargo vessel in an American convoy of vital war supplies, Spike Mason overhears the radioman send their location for a marauding German patrol boat and Mason must act fast. 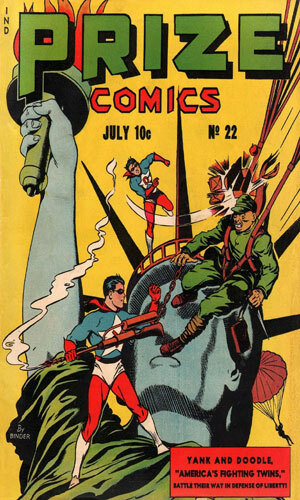 From Prize Comics #17 - Sailing near the deserted Wake Island, a US naval vessel spots an American flag flying upside down. Investigating, Spike Mason and his new cohort, Ford, go ashore and discover a whole lot of Japanese soldiers. From Prize Comics #18 - When the Malibu is loading a shipment of TNT in Manila, Spike Mason spots a suspicious looking stevedore. Looking into it unveils a plot to blow up the vessel while at sea and disrupting the supply chain. From Prize Comics #19 - In Hong Kong the Malibu is bringing much needed aviation gasoline to the British. A subversive Mongrel band named the Scorpions, led by a masked chap named Komaru and working for the Japanese, are to destroy it. From Prize Comics #20 - The cargo the Malibu carries is medium tanks bound for the Netherlands East Indies. In Manila the ship takes on new deck hands and several are working for the new bo'sun, Patch, who has orders to scuttle the vessel. 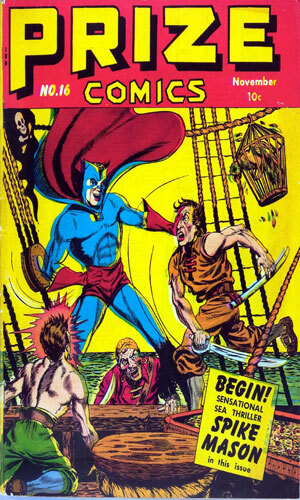 From Prize Comics #21 - A would-be pirate working for the Japanese wants to steal a ship to accost the Malibu and take it over as it hauls a cargo of oil for China. He needs a crew and happens to shanghai two Americans visiting a bar - Spike Mason and his pal Ford. From Prize Comics #22 - In Australia loaded with munitions, the Malibu's schedule does not allow shore leave but Ford decides he needs it. The trouble he gets into is impressive. And so is the lovely lady who traps him and then saves him. 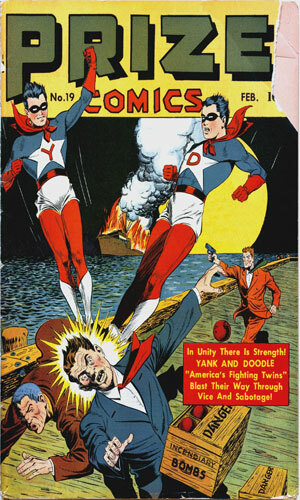 From Prize Comics #23 - A Japanese sub puts the Malibu in dangerous straits and Spike Mason decides a fake surrender is in order. Things get very strange from then on. The action is standard fare for that time with the enemies of freedom and democracy literally at America's doorstep (well, they kinda were when you think about it). Talking with a few from that generation (like my parents) showed me they all knew it was likely coming though they tried to not think about it and hoped it wouldn't. In the comic books, it was the same way - on its way but maybe with the bold actions of some stalwart fellows like Mason, it could be held back for a while. As with other series in these anthology publications, it is really tough to tell a decent story and give background on the character to flesh him out all in 6-8 pages. Rightly so, the author in the Spike Mason tales went for the action and drama over the 'let me tell you a little about myself'. Still, a small panel heading of maybe two lines here and there could have given us more scoop. Oh well.